Avis has graciously agreed to tell us a little something about weaving. Thank you Avis! Weaving Basics: Weaving is a method of making fabric by intertwining of threads in opposite directions. Two distinct sets of threads, called the warp and the weft, are interlaced with each other to form a fabric. 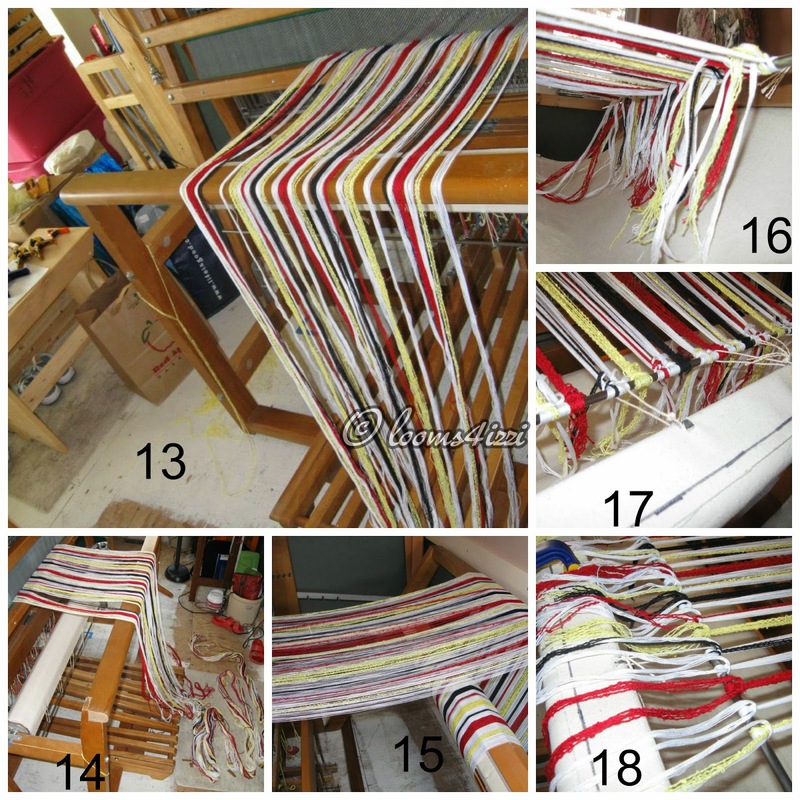 The warp threads run lengthwise in the piece of cloth and the weft threads run across from side to side. 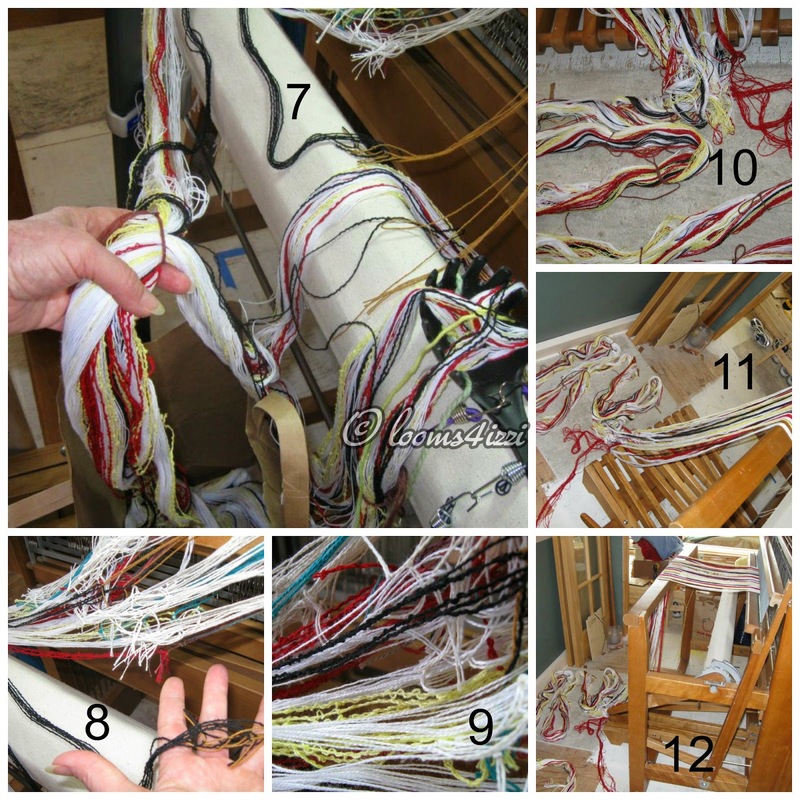 The loom is dressed with the warp threads passing through harnesses (two or more). The warp threads are moved up or down by the harnesses creating a space called the shed. A shuttle carries the weft through the shed. 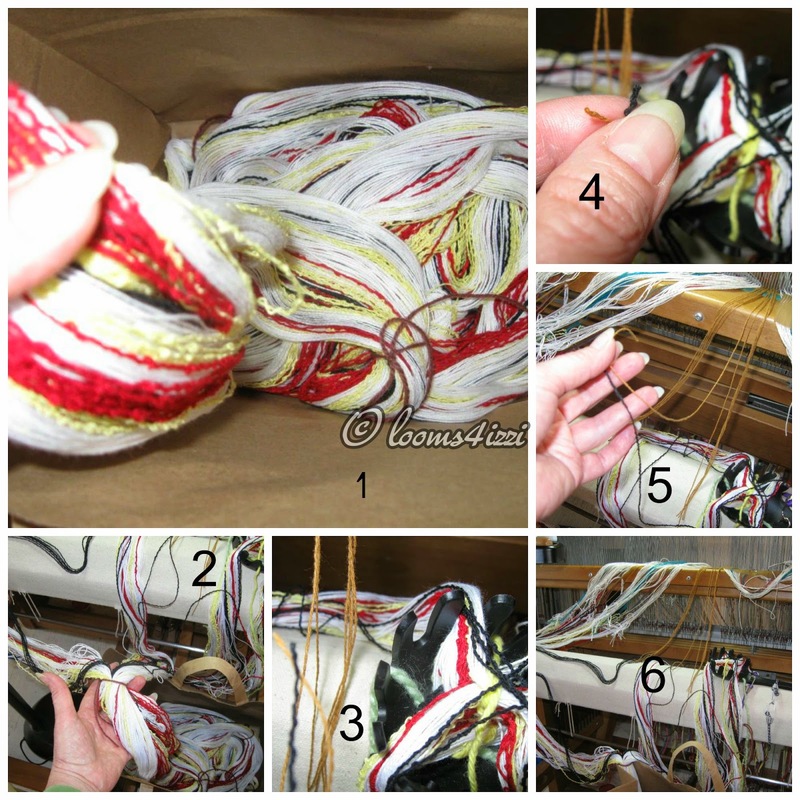 By lifting the warp threads in specific sequences you can create many possible weave structures. Fabric texture is obtained by changes in the thickness and smoothness of yarns/threads for example, satin bed sheets and rag rugs. Fabric diversity is also limited by the type of weaving loom. There are looms you can use on your lap, floor standing looms, table top looms, machine driven looms, and hand manipulated looms. How flowing the 'drape' of the fabric becomes is determined by the weave pattern and threading of the 'heddles' of each harness. 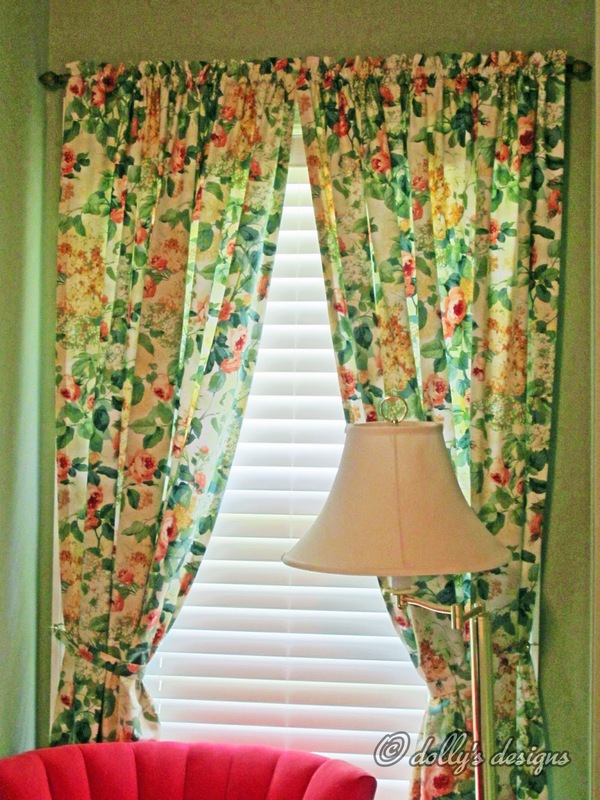 Twill drapes nicely and the diagonal weave pattern allows the flow of fabric or stretch/give of fabric. Examples of twill fabric are gabardine, denim jeans, or tweed The most basic twill weave is two threads in one direction, crossed over by a single thread in the opposite direction. This gives the weave its characteristic design, although the weave can be far more complex depending upon the degree to which the weaver wants a design in the twill to show. Hobby weavers often have 'favorite' weave and fabric structures that vary from towels, rugs, delicate scarves, wall art, blankets and more. Their library of patterns books and storage of yarns and threads are expansive. Wool, cotton, linen, silk and bamboo are quite different in hand and weaving performance. Winding treads on the warping board (which is strapped to the scaffolding, a benefit of living in a house while still in construction). 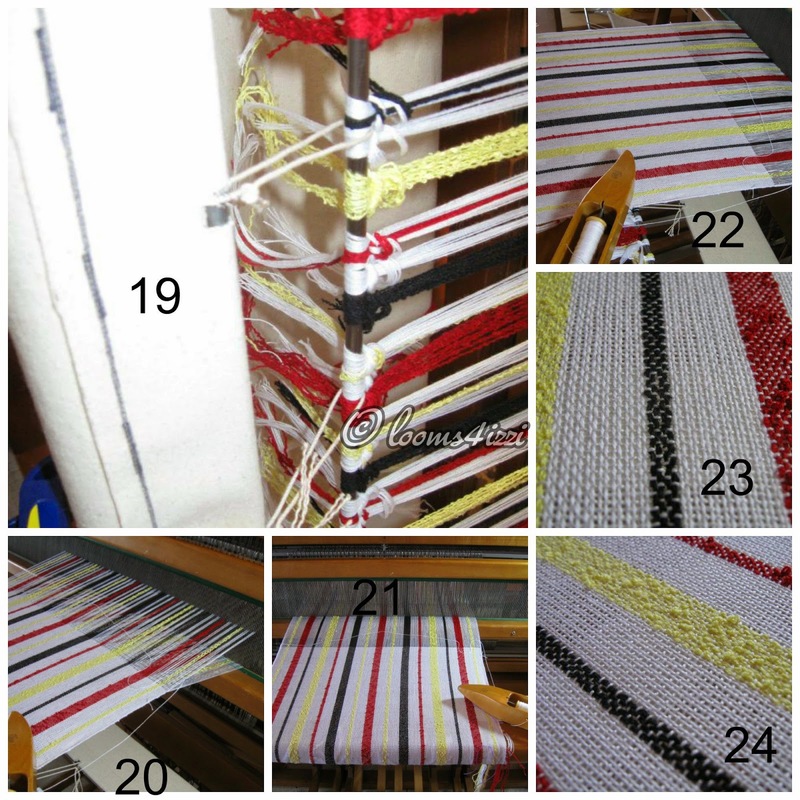 From the warping board, the big long 24 feet of threads (in order of vertical stripes) are dressed onto the loom (photos). 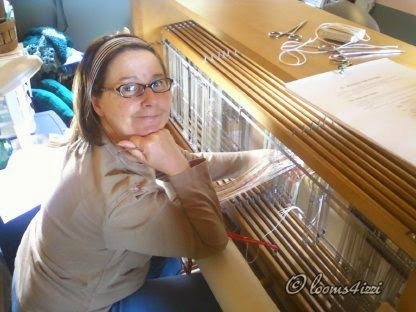 When warping the threads on the warping board (pegs), there were some 400+ threads, each 24 feet long. The actual weaving video. Stepping on the treadles raises a harness creating a 'shed' which is where the shuttle travels through, then that weft thread is 'beat' against the previous weft threads comprising the fabric. There is a great rhythm in this weaving sequence, very relaxing. Hello all! 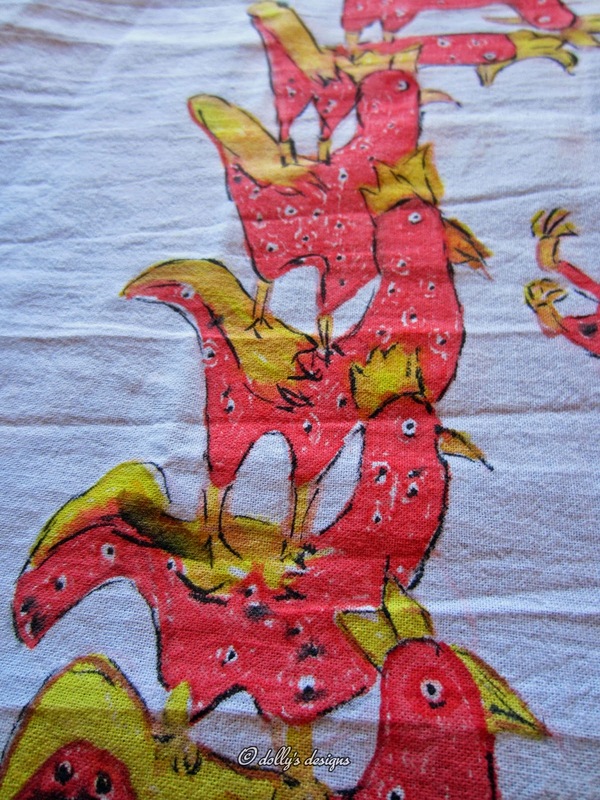 You may remember my last post of the tea towel that I painted for my new friend Avis. 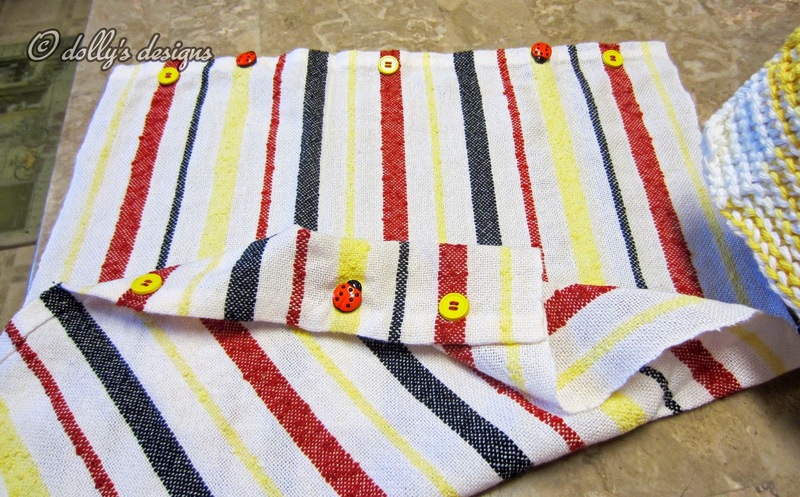 She made me an absolutely beautiful handwoven tea towel with the cutest button embellishments. Did you catch that HANDWOVEN! Wow the time and talent it takes to make one of those. I love our group on Facebook Farmgirl Chit-Chat. We meet the nicest people and that is how I met Avis! Look at these! 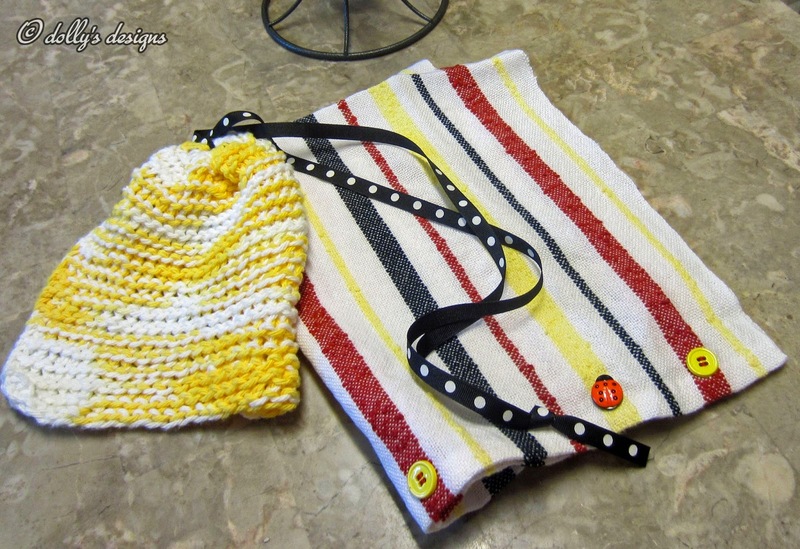 A hand knitted dishcloth with a gorgeous ribbon to hang it by cute design and the wonderful handwoven tea towel. Cute buttons highlight this beautiful item! I wish you could see this in person. The detail is wonderful! Do you weave your own fabrics? I always knew that it was a task but I didn't realize just how much work does go into the making of fabric. Avis has Graciously allowed me to post some videos and a quick tutorial as to how it is done. I'll post that soon and link it here. I want to show you some of the steps in Avis's photographs. It is amazing the amount of work it takes to hand weave the fabric. They're numbered to show you the order in which they go. Avis at work with a smile on her face! Wow! Isn't it beautiful? Can you believe the steps it takes to make this gorgeous piece of material? I didn't realize. 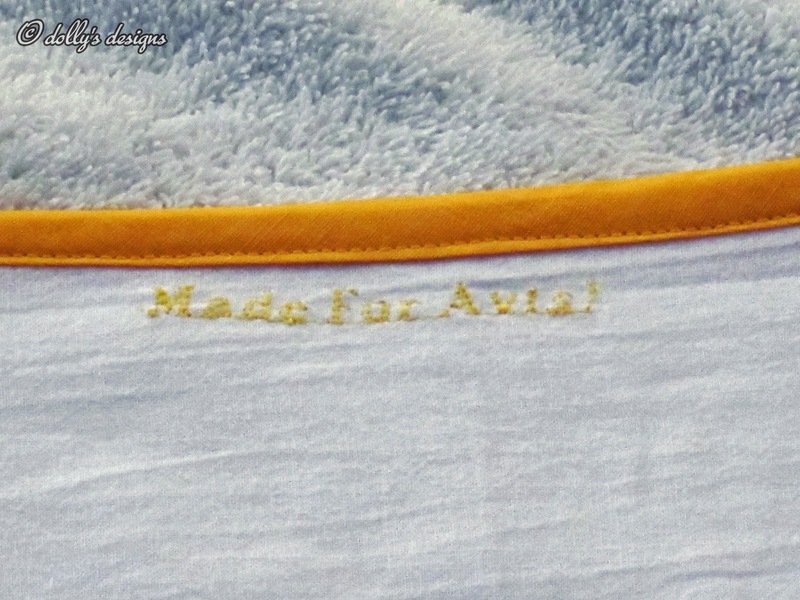 This is the material with which Avis made the above tea towel for me. It is a special item and I will always treasure it! 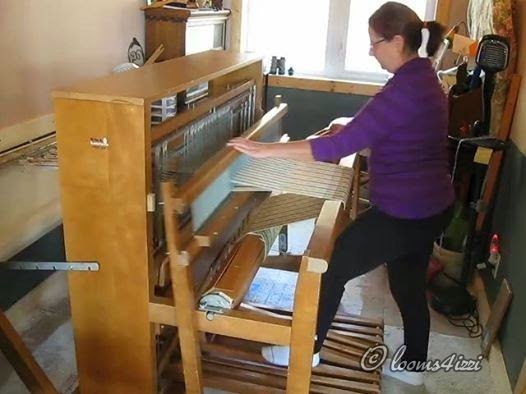 Next post Avis will give us the basics of Weaving along with three videos! Stay tuned you won't want to miss it! 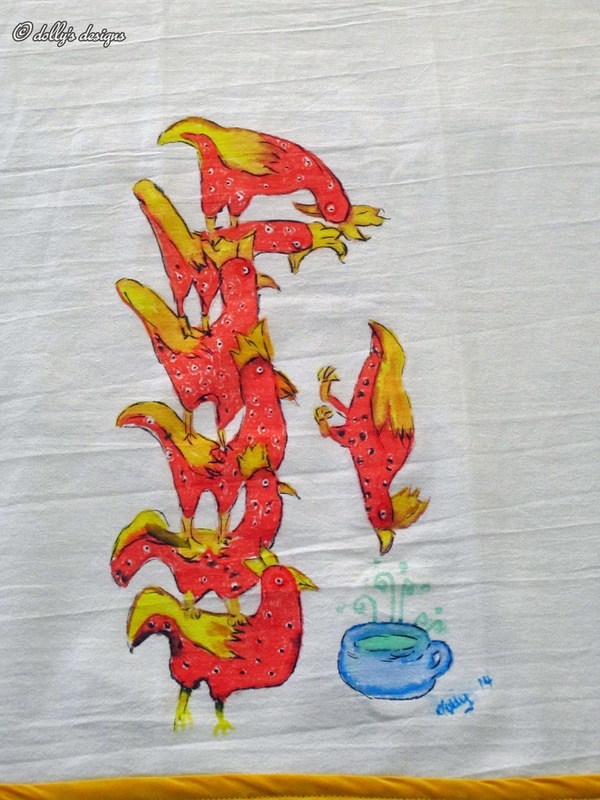 Painting a Tea Towel and the Story Behind it! Good Morning! We have a wonderful group called Farmgirl Chit-Chat. We are always doing something, making something, exchanging something. 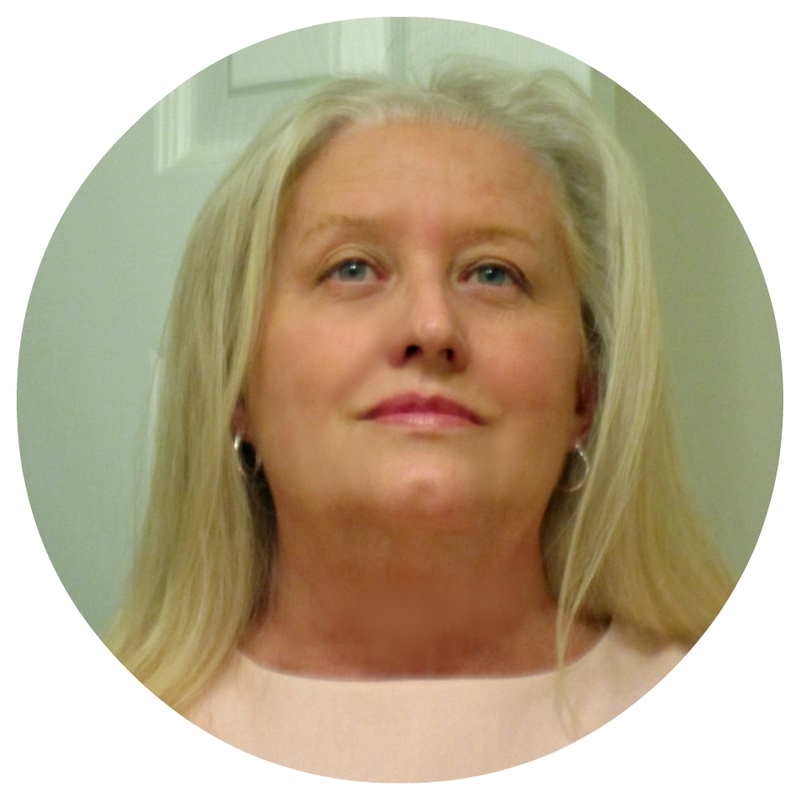 It's a fun and informational page, come join us if you will. This exchange was for homemade tea towels. I asked my exchange partner what colors she liked or had in her kitchen. She told me that her entire kitchen was decorated from a rooster. 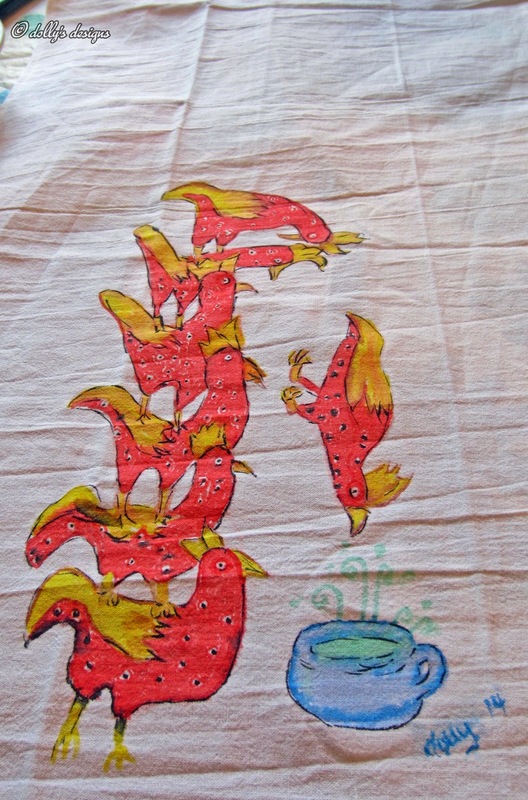 A dear friend of hers painted the picture that became my inspiration for her tea towel. This is the finished product. 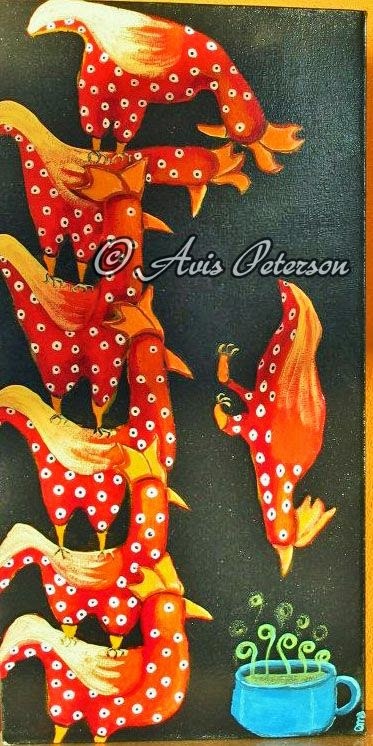 It is a whimsical design that Avis loved because her dear friend painted the picture below for her kitchen. The artwork of Debra Baker, Avis's dear talented artist friend. 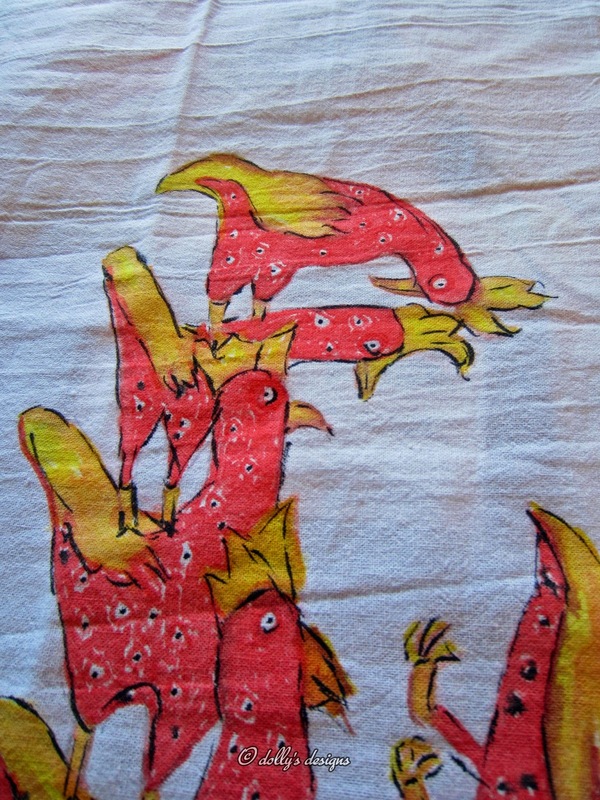 The inspiration for the tea towel I painted for Avis. I could not find my fabric medium so was forced to paint this with fabric markers. I have never done this before. I found out that fabric markers run and do so very badly. They did the job though and that's what counts. I like the fact that you don't have to heat set them. They are chlorine resistant so should laundry up pretty well. Printed a copy of Debra's Artwork from internet. 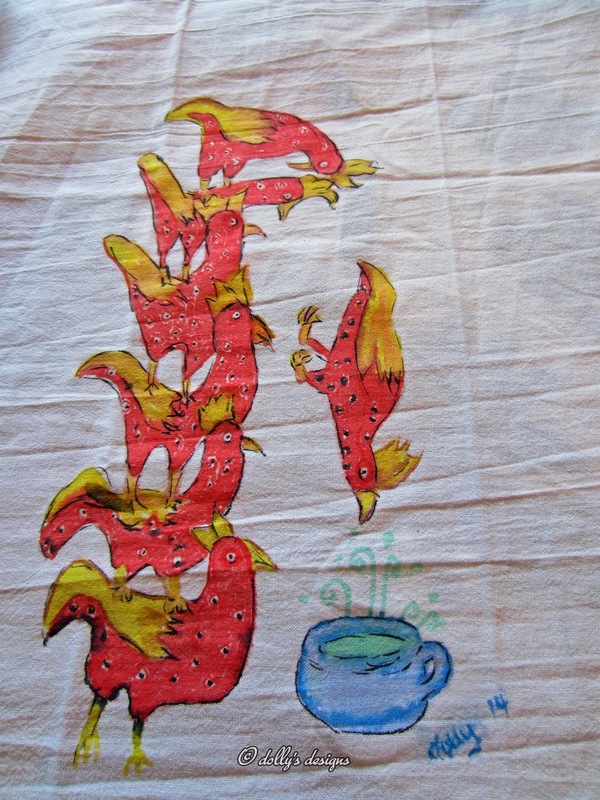 Placed image on tea towel using Dressmakers Tracing Paper. Looking at her copy I painted the design as closely as I could mixing colors to achieve this. It was such a fun picture to do. I can tell Debra must have had such a great fun personality. Still working have lots of shading and fine tuning to do with this. In an effort to get more of the colors she loves I added this bias trim to the towel on both ends. I looked and decided No this just won't do it. This needs something extra. How do I pull in the black? I found some wonderful gingham premium cotton fabric! That was it! I started to gather and it just wouldn't lay right so decided to do pleats. Yes I was Happy with this! Work signed and ready to send out! Always sign your work in some form or another. Yes I did personalize it be it crooked..sorry Avis. This was such a fun project to do. I thought of Avis as I made it and her precious friend Debra who painted the inspiration. I have to admit I talked to her as I painted and thought of the sense of humor she must have had. Avis liked it and that has pleased me immensely I have to say. She had the following to say with some really great pictures. Please read and it will tell you the whole story!
" 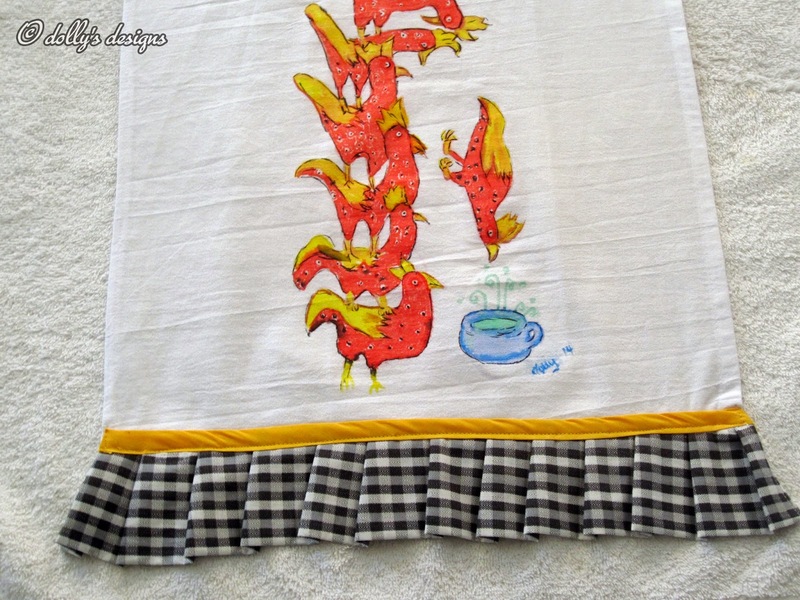 Dolly Johnson Sarrio went to grand effort indeed to sew a charming tea towel with a replicate of my kitchen chicken painting created by a dear friend, Debra Baker who is now passed onto Heaven. 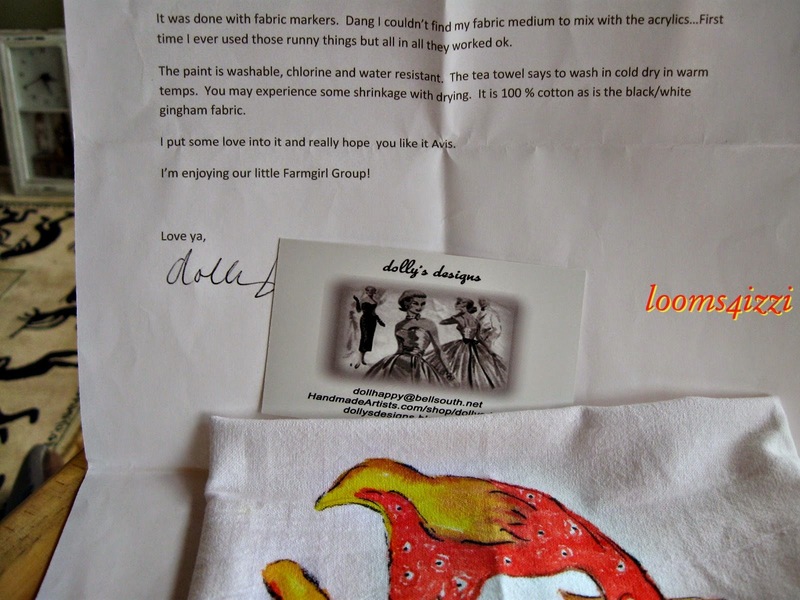 Dolly sent a heart felt message to honor Deb's painting with hopes of cheer. 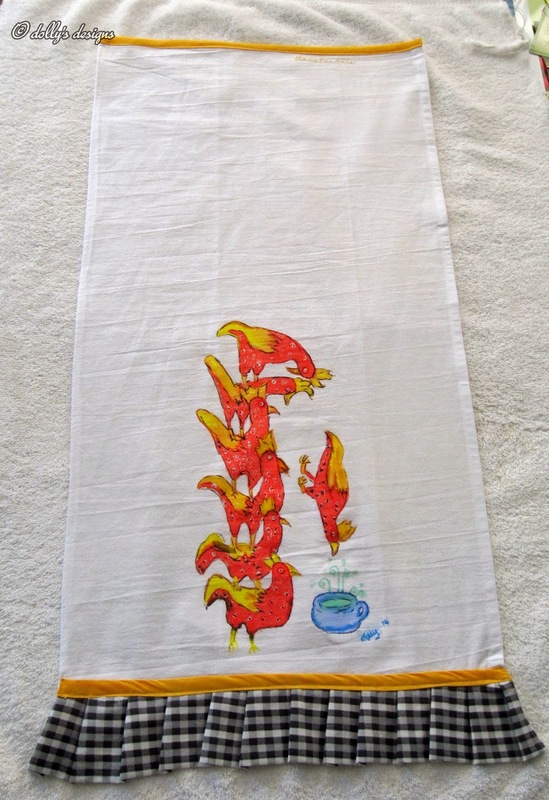 I got goose bumps when I looked at the towel, it's so wonderful to see two 'gifted' women in one project. Thank you and I'm having a happy dance!" Next post I will share the wonderful creation that Avis sent to me! A handwoven tea towel! Can you imagine Handwoven! It is beautiful and I really like it! Enjoy the rest of your weekend and remember to create some beauty in the world. Yes You, you are talented in more ways than you probably know! I'd like to show you the custom made items made for Sara's Home. 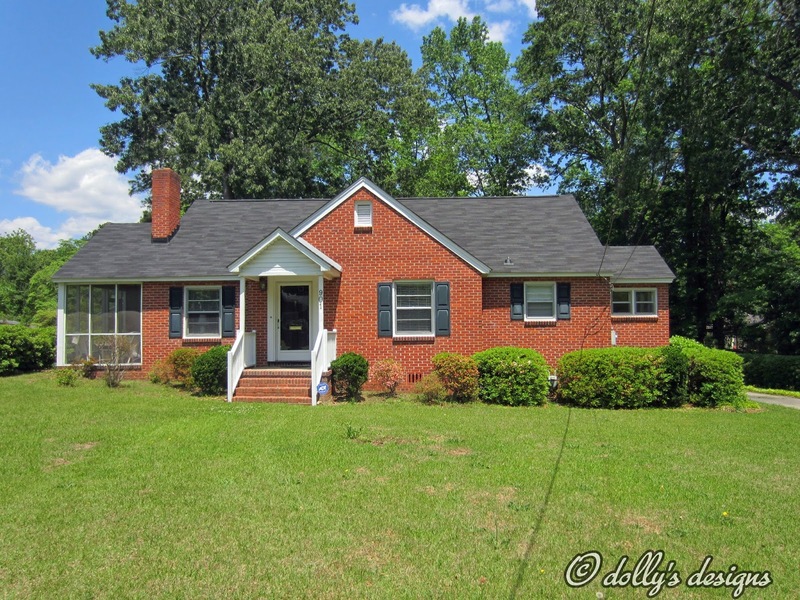 The items will be shown here and the home tour itself will be shown over at the main blog Hibiscus House. So please take the time to see how this looked in her home decor over there. The link will be placed at the bottom of this post. Simple but lovely because Sara can really coordinate and decorate a home. Rod Pocket Tiers with tie backs. 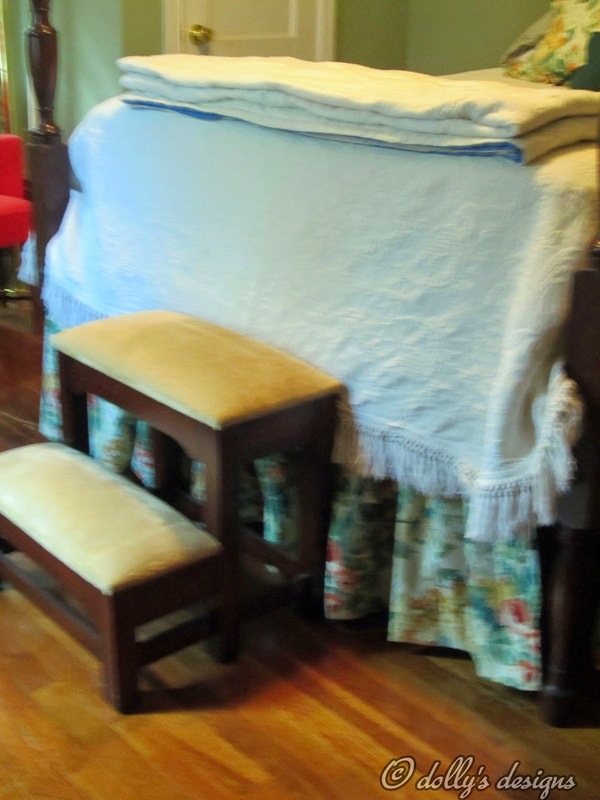 To see more of the Bath in the home tour go to Hibiscus House. The Link will be at the bottom of this post. I apologize for the quality of the photographs. But hopefully you can get some idea of how these items look. I found this wonderful image from a friends page. 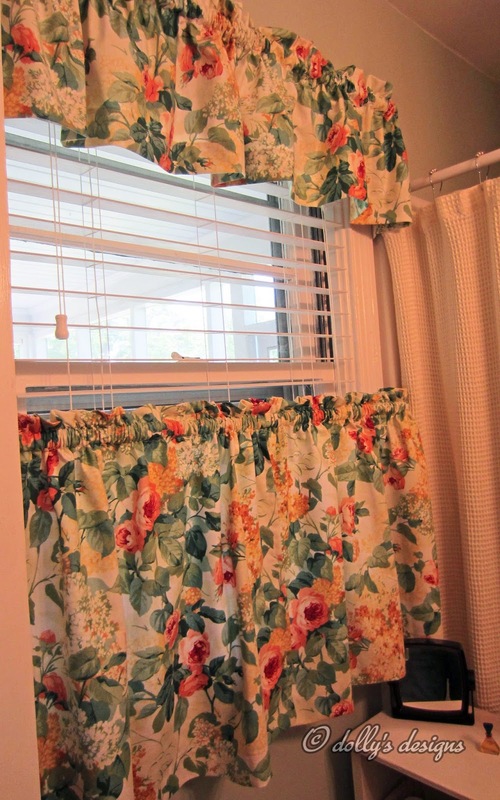 Little Susie Homemaker Blog Isn't it adorable? 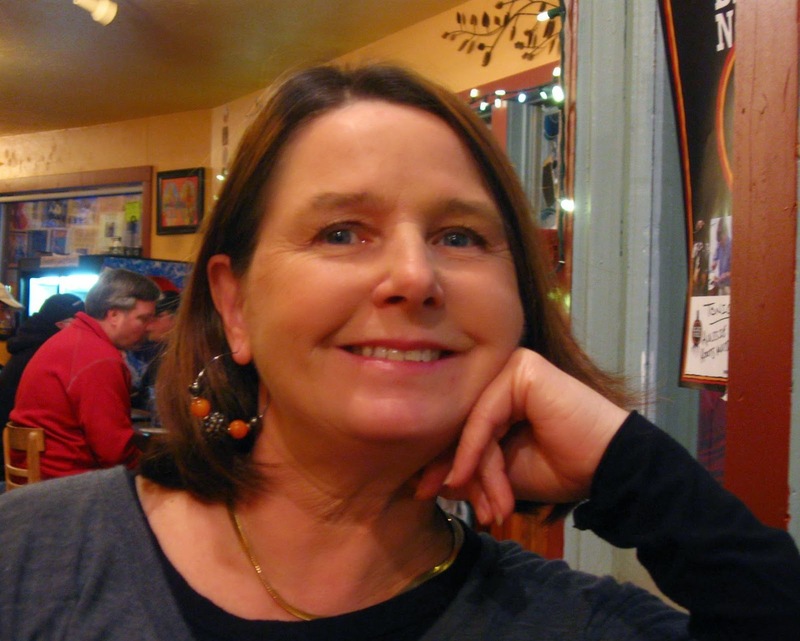 Check out her sites. 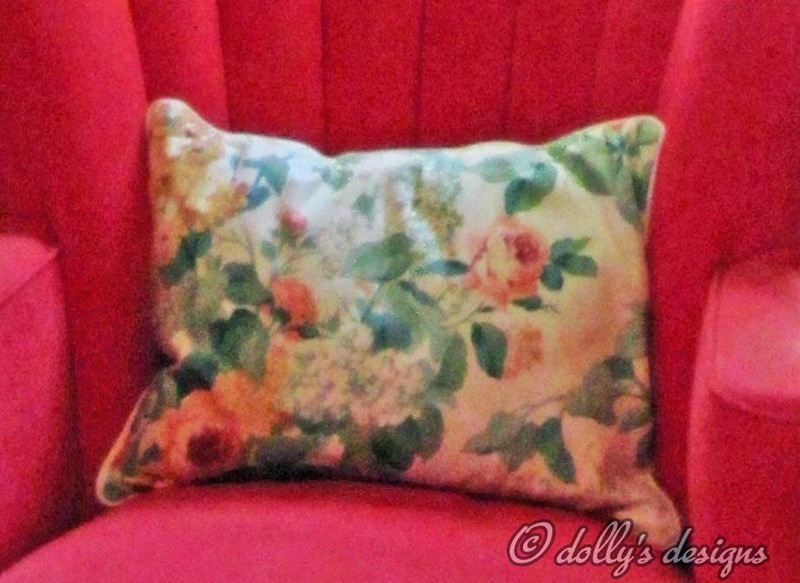 Welcome to designs by dolly. This site will be a collection of items that I myself will be making. Most will be "One of a Kind Items". You may see the fabric in other items but never in the same item over once. 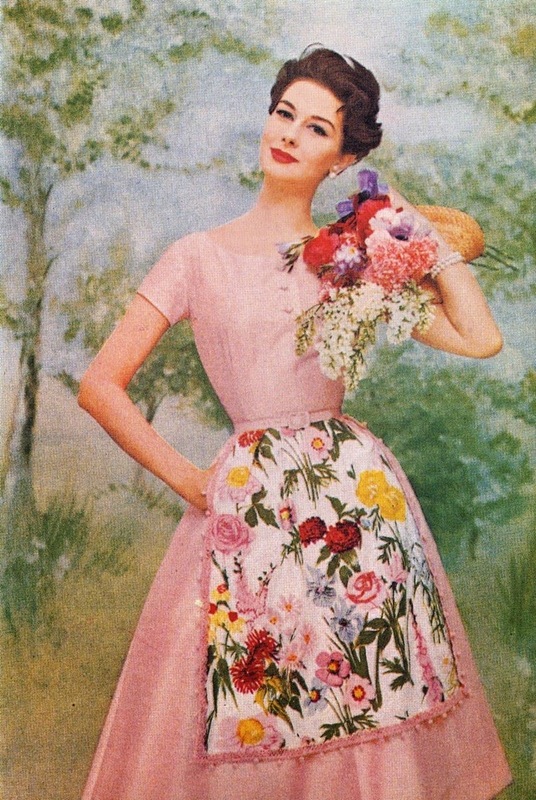 The exception will be only certain items that have to be made in certain fabrics simply because of what they are. This will be noted. Aprons are the item featured now. I will have lots more items in the near future.such as place mats, napkins, tea towels, pillow covers and numerous other items from the sewing room. 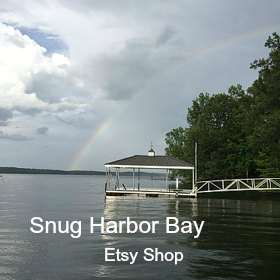 I do offer a limited special order on certain items. That means that I will offer up the selection of premium fabrics on this item for you to choose from. I don't want to give it away but we will have clay items for sale in the near future. Welcome!